Photograph of the northern portion of the west face of the Kantaji Temple at Kantanagar, taken by John Henry Ravenshaw around 1871. This temple was built in 1752 by Maharaja Pran Nath of Dinajpur and is one of the most elaborate of the late medieval brick temples of Bangladesh. The temple stands on a sandstone plinth and has the curved cornice typical of buildings in this area. It comprises three tiers originally topped by an impressive tower. There were additional smaller towers at the four corners of both the lower tiers. All nine towers were later destroyed during an earthquake in 1897, while the body of the temple still survives today. The inner sanctuary has three entrances and is surrounded by a verandah that has three arched openings on each face. The exterior is decorated with terracotta plaques and relief carvings of varied floral and figurative motifs. 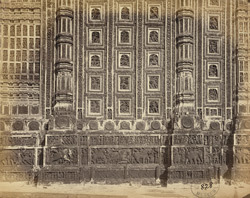 This is a close view of a section of the facade, showing the relief sculpture panels between the pilasters.